In the second phase, polling is being held in 25 districts, six municipal corporations and 189 urban local bodies. 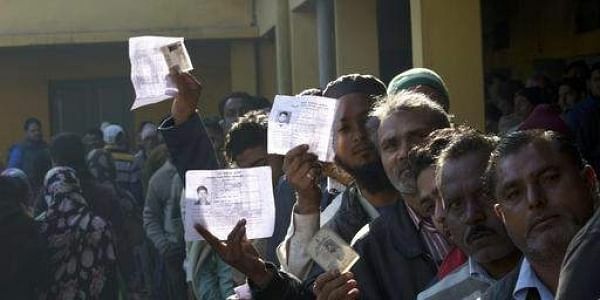 LUCKNOW: The voting for the second phase of local body elections in Uttar Pradesh has begun. Muzaffarnagar, Ghaziabad, Gautam Budhnagar, Amroha, Rampur, Pilibhit, Shahjahanpur, Aligarh, Mathura, Mainpuri , Farrukhabad, Etawah, Lalitpur, Banda, Allahabad, Lucknow, Sultanpur, Ambedkarnagar, Bahraich, Shrawasti, Sant Kabirnagar, Deoria, Ballia, Bhadohi and Varanasi districts go to polls today. In the first phase of elections held on November 22, over 52 per cent voting was recorded. The third and final phase of civic polls covering other 26 districts will be held on November 29. The counting of votes for all phases will take place on December 1 and the results will be declared that day.